Did the Church of England stop colluding with Babylon? George Monbiot, writing in The Guardian last night, accused the Church of England of “colluding with Babylon”. 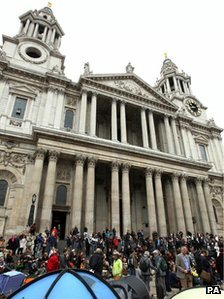 But in the latest developments this afternoon St Paul’s Cathedral has suspended its legal action to evict the Occupy London Stock Exchange protesters, and has announced an initiative “reconnecting the financial with the ethical”. The initiative is to be headed by former banker Ken Costa, who left his top job as chairman of Lazard International earlier this year, but is apparently still Chairman of Alpha International and a churchwarden of Holy Trinity Brompton. Giles Fraser, who resigned as the cathedral’s Canon Chancellor because of his sympathy with the protests, will also be involved in the initiative. So did the alleged collusion just come to an end? Monbiot’s article The medieval, unaccountable Corporation of London is ripe for protest is a shocking exposé of how the Corporation of the City of London, the city’s official local government, is controlled by banks and other financial companies, and is almost without any democratic accountability. Yes, the 9,000 residents of the Square Mile can vote, but only in four of the 25 wards (voting districts), and the representatives of the others are chosen by companies. the absence of proper regulation in London allowed American banks to evade the rules set by their own government. AIG’s wild trading might have taken place in the US, but the unit responsible was regulated in the City. Lehman Brothers couldn’t get legal approval for its off-balance sheet transactions in Wall Street, so it used a London law firm instead. No wonder priests are resigning over the plans to evict the campers. The Church of England is not just working with Mammon; it’s colluding with Babylon. Yes, it is this same City of London Corporation which is taking legal action to evict the Occupy London Stock Exchange protesters, or at least their tents, from in front of St Paul’s Cathedral. The camp is apparently partly on corporation land and partly on cathedral land. Last Friday the cathedral authorities announced that they would take similar legal action. And it was very likely this prospect that prompted Monbiot’s accusation “colluding with Babylon” – although it would have been more fair to direct the accusation at St Paul’s rather than at the Church of England in general. Was it this prospect of legal action that also prompted the resignations first of Giles Fraser and then yesterday of the cathedral’s Dean, Graeme Knowles? I guess we will only know if they choose to tell us. One thing we can be sure of, though, is that this occupation, although not originally directed at the cathedral, has exposed massive divisions within it between those who, if not actually colluding with Babylon, want to uphold the status quo, and those who are sympathetic to the protesters’ campaign against the strongholds of Mammon. I had wondered, indeed even publicly in a comment this morning on a post by Scot McKnight, if the Bishop of London’s intervention today might lead to a harder line against the protesters. After all, Bishop Chartres is very much an establishment figure (it was he who disciplined Bishop Pete Broadbent last autumn for criticising the royal wedding) and might be expected to support the status quo. So I am pleasantly surprised that after meeting with him the cathedral authorities are taking the steps that they have announced. They no doubt hope that this will prompt the protesters to leave their camp, but I don’t think it will. The events of the last few days have been yet another public relations disaster for the Church of England – or perhaps not, if one subscribes to the view that the only bad publicity is no publicity. But in fact the last major alleged disaster turned into something of a triumph. Can the same happen on this issue? If the church can present itself as agreeing with the strong popular sentiment against excessive corporate greed, but without identifying itself too closely with any specific political positions, then this could greatly enhance the Church of England’s public image. And if this has to be done over the resignations of some church people who would prefer to collude with Babylon, then that can only be for the good. PS (after about an hour): Although they are on the same site that I linked to above, I have to thank David Keen on Twitter for linking to two recent articles by Ken Costa about the St Paul’s situation: Reconnecting the financial and the ethical (PDF) and Why the City should heed the discordant voices of St Paul’s. These are significant not only for their content but for who is writing this and where he is presenting it: the recently resigned chairman of a major international bank, respectively speaking in the palace of the ruler of Babylon, i.e. the Lord Mayor’s Mansion House, and writing in Mammon’s own daily newspaper, the Financial Times. This entry was posted in Anglican Churches, Church, Politics by Peter Kirk. Bookmark the permalink.